Rediff.com » Business » It's the population, stupid! India is poorer than the world average and so naturally has a greater percentage of poor people and a lower percentage of rich people. Yet using absolute numbers, India has more of almost everything, which is misleading, says Debraj Ray and Maitreesh Ghatak. When confronted by a Large Indian Statistic, consider dividing by the population. We learn from the same source (New World Wealth) that the world has 495,000 multimillionaires, and India has 14,800 of them. 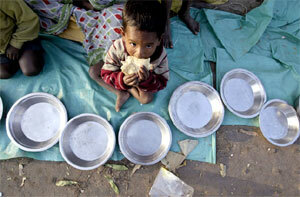 Divide: India has just 3 per cent of the world's multimillionaires. It has, however, 17 per cent of the world's people. Suddenly India is looking like it does not have its “fair share” of multimillionaires. Now, of course, India is a poorer country. The real question is whether India has more than its expected share of multimillionaires once we take into account this fact. To do this in a lot of detail will take some real work, but we’re in a back-of-the-envelope mood for this post. So, whipping out a handy envelope on World Bank letterhead, we carry out some quick calculations. In 2012 Indian per-capita income was $1,550, and world per-capita income around $10,235, suggesting that the ratio of Indian per-capita income to the world average is a measly 0.15. Meanwhile, the multimillionaire ratio (India’s share relative to its population) is 3/17 = 0.17. These two ratios are very close, which suggests that neither self-congratulation nor admonition is quite called for at this stage. But we will need to dig deeper. Let’s think about millionaires for a moment: those with assets of $1 million or more. According to WealthInsight (see this link), India had 251,000 millionaires in 2012, around 0.02 per cent of the population. The corresponding number for the United States is 5,231,000, around 1.64 per cent. Thus, using the United States as a benchmark, India’s millionaire share in the population relative to the US is 1.22 per cent (the ratio of 0.02 to 1.64). At the same time, India’s per capita income is only 3 per cent of that of the US. So: does India have too few millionaires relative to the United States, after making the income correction? Not really: if two countries have the same level of relative inequality but different mean incomes, a halving of mean income predicts a change in the population incidence of (multi)millionaires by a factor that typically comes down by more than half, the exact prediction depending on the distribution of wealth. This is (in part) because “millionaire” or “multimillionaire” is a threshold concept: a fixed monetary figure ($1 million for the former, $10 million for the latter) has to be crossed. One good way to explore the predicted change is to employ a Pareto distribution of wealth, along with the population-weighted average Gini coefficient for wealth distributions (which is a bit over 0.65, and calculated from this link). Then a halving of per-capita income is expected to lower the (multi)millionaire share of the population by a factor of approximately 2.38. If we really go out on that limb and plummet from the heights of US per-capita income ($50,660) to that of India ($1,550), we would expect the both the millionaire share and the multimillionaire share in India to be approximately 1.28 per cent that of the United States. Since the actual millionaire share in India relative to the United States is 1.22 per cent, which is remarkably close to the prediction, India does not appear to be out of line, as far as millionaires are concerned (and after we have corrected for economic differences). But the case of multimillionaires tells a rather different story. In India the multimillionaire share is 0.001 per cent of the population, while in the United States it is 0.058 per cent. Taking ratios, we see that the multimillionaire share in the population in India is 2.06 per cent of the corresponding share in the United States. This number is surely high relative to the prediction of 1.28 per cent. This parallels findings by Piketty and his colleagues. India does not stand out in terms of income going to the top 1 per cent, but it does in terms of income going to the top 0.1 per cent. While there is noise in all these data, we would tentatively conclude that India, controlling for economic differences, has “more multimillionaires than it should.” While this may generate applause in some circles, we would therefore side with the admonitory warning bell sounded by Raghuram Rajan. Notes and Sources: Relative Income is country per-capita income relative to US per-capita income (from the World Bank Databank). M-Share is millionaire divided by population, in per cent, and MM-Share is multimillionaire divided by population, in percent (from Times of India, New World Wealth, WealthInsight, and United Nations). Predicted Relative Share uses Relative Income and a Pareto distribution, along with the population-weighted average of within-country wealth Ginis (approx. 0.67) to generate predicted relative share of millionaires and multimillionaires in each country relative to the United States, in percent. Relative M-Share and Relative MM-Share are the actual relative shares generated from columns 3 and 4, by expressing those numbers relative to the US numbers, in per cent. Remembering that the United States is itself a country with very high inequality, this is additional cause for concern. For instance, China comes in below its predicted value for both millionaires and multimillionaires, and countries such as Japan and Germany come in far below the predictions for multimillionaires, as does the world as a whole. Countries with a significantly higher share than their predicted values are Hong Kong, Singapore and Switzerland (see Table). Take away points? India is poorer than the world average and so naturally has a greater percentage of poor people and a lower percentage of rich people. Yet using the absolute numbers, India has more of almost everything, which is misleading. Indeed, correcting for income differences, India has the “expected share” of millionaires relative to the United States. However, looking at the super-rich, namely, the multi-millionaires, India does have more than its expected share: something not too savory is cooking on the very end of the right tail. Lesson: for India, always do the percentages, whether for multimillionaires or for farmer suicides. We might then learn something. Endnote: A previous version of this post contained a cautionary endnote explaining that our rudimentary analysis could be complicated by a proper accounting of threshold effects. Following up on this, we subsequently extended the analysis. Published with the kind permission of authors Debraj Ray and Maitreesh Ghatak. Ray is an Indian-American economist whose focus is development economics and game theory, and Ghatak is a Professor of Economics at the London School of Economics. India became home to 1.56 lakh millionaires in 2013!